4Videosoft iPod Manager for Mac also acts as Mac to iPod Manager and iPod to Mac Manager. Obviously, it can transfer videos, audios from iPod to Mac, and transfer audios, videos on Mac to iPod without iTunes, the formats are compatible with all iPod supporting formats. Of course, all the functions are available to iPhone. 4Videosoft iPod Manager for Mac, as expected, supports all the iPod devices, including iPod, iPod nano, iPod classic. It can transfer videos, audios from iPod to Mac and Mac to iPod without iTunes. ...... Moreover, the operating procedure is just like a breeze: plug iPod to Mac, import Mac files/folder to iPod or select the files you want to backup, then click "iPod to Mac", copying iPod for Mac is finished. 4Videosoft iPod Manager for Mac success to manage audios, and videos on Mac to iPod directly and the managing formats are compatible with iPod supporting formats. 4Videosoft iPod Manager for Mac also assists you to transfer audios, and videos from iPod to Mac. Sorted by Genre, Artist, Album, so you can find want you want quickly and easily. After you plug your iPod, this software would read the iPod all properties, including the iPod type, capacity (used and available space), version, serial number, and format. Qweas is providing links to 4Videosoft iPod Manager for Mac 3.2.12 as a courtesy, and makes no representations regarding 4Videosoft iPod Manager for Mac or any other applications or any information related thereto. Any questions, complaints or claims regarding this application 4Videosoft iPod Manager for Mac 3.2.12 must be directed to the appropriate software vendor. 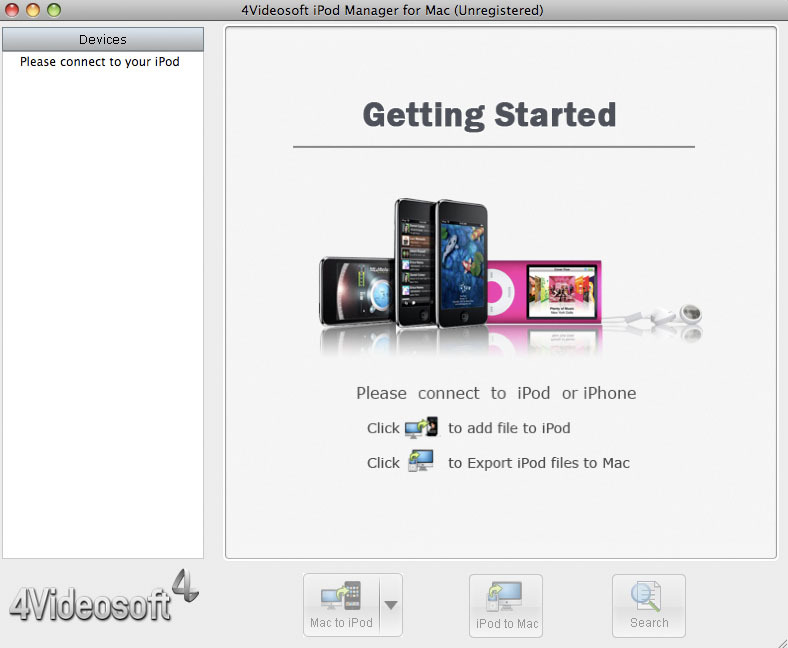 You may click the publisher link of 4Videosoft iPod Manager for Mac on the top of this page to get more details about the vendor.